Thomas Eisenmann, professor of Business Administration at Harvard Business School teaches the management of ventures and startups. 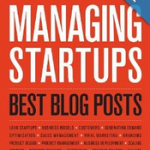 He recently published his famous annual compilation of best blog posts on startups into a book/ebook entitled Managing Startups: Best Blog Posts. O’Reilly was generous in their willingness to publish it, while donating all of their profits to Endeavor Global, a global organization that fosters entrepreneurship. So, if you click on that link and buy the book, you would be doing yourself a favor and helping a good cause. His seminal collection has been an inspiration for me, and is a must read for any entrepreneur. Tom just wrote an excellent article, Head Games: Ego and Entrepreneurial Failure (original link, and reposted here with permission), where he talks about the causes of entrepreneurial failures, whether they are ego-driven or coming from other reasons, and he ends by suggesting how to “fail right”. In the article, Tom draws on recent blog posts from Mark Suster, Paul Graham, Peter Thiel, Steve Blank, Brad Feld, Jerry Colona, etc…and puts it all into a cohesive and practical context. This is a MUST Read, let alone for the extensive links in it. There’s no science behind my characterization of founders’ egos as lying somewhere on a spectrum that ranges from ambivalent to obstinate. I’m sure this one-dimensional view makes trained psychologists cringe, because it ignores a mountain of research pointing to a “Big Five” set of stable personality traits: openness, agreeableness, extraversion, conscientiousness and neuroticism. Adeo Ressi’s Founder Institute draws on such research in the admissions test for its training program. Based on analysis of responses from over 15,000 aspiring entrepreneurs, the test sheds light both on the traits of successful founders and the attributes of Bad Founder DNA: excuse-making, predatory aggressiveness, deceit, emotional instability, and narcissism. Founder Institute’s research confirms: it’s all in the head! So, what should a founder to do to master the monsters in her head?